This is a KISS card. KISS mean "keep it so simple". I used the Punch Bunch from the Sale-a-Bration brochure, square scallop punch, and a scallop circle punch. Quick, easy, and by changing the colors of the card stock will work for anyone who is having a birthday. Owls are so popular this year. Stampin' Up! has made sure you have quite a selection including one in our Sale-A-Bration catalog in the stamp set called Punch Bunch. It consists of 5 stamps where each image matches up with one of our paper punches. I accented the owls using the 2 3/8" Scallop Circle Punch, item #118874 and created the border using Eyelet Border Punch, item #119853. During Sale-A-Bration, every time you spend $50 (before tax & shipping), you earn one FREE product from our Sale-A-Bration Brochure. What a great time to add to your crafting supplies. May you find peace and comfort in this difficult time and know that you are loved. You may order from my Stampin' Up! website 24/7 by CLICKING HERE, then click on Shop Now or by contacting me directly. My e-mail link is at the top of the screen. Sale-a-Bration is a great time to earn FREE Products from Stampin' Up!. Click on the Sale-A-Bration link on the right side of my blog to find out how. If a customer asks me which stamp set I would recommend, I ALWAYS tell them Teeny, Tiny Wishes. This Stampin' Up! stamp set consists of 24 stamps and covers almost every occasion during the year. Another reason I like this stamp set so much is because it is a perfect fit for the Word Window Punch and the Modern Label Punch. They work so well together. To accent the scallop circles I used a Stampin' Up! Uni-ball Signo Gel Pen. It is opaque and stays white when dry. I find it works best when held straight up and down with slight pressure. When you store this pen, store is straight up and down unlike our Stampin' Write Markers which are store horizontally to keep moisture on both tips. It is wonderful all the looks you can create using paper punches. The Eyelet Border Paper Punch adds a special touch to the base of the card. A strip of white card stock would of been fine, but this makes the card a bit more special. You may order from my Stampin' Up! website 24/7 by CLICKING HERE, then click on Shop Now or by contacting me directly. My e-mail link is at the top of the screen. Remember, during Sale-A-Bration you earn 1 free product for every $50 spent (before tax & shipping). I'm a firm believer in using up scraps of paper rather than throwing them out. I had prepped extra cards for classes on Saturday and didn't need the extras. So now am in the process of creating cards with them. I made this gate fold card today, and posted a tutorial for gate folds the other day on my blog. Combining Real Rose and Wild Wasabi was a big hit with my students at classes here on Saturday. Did you notice the accent of tiny pearls on the flowers? I think it adds a touch of elegance to the cards. Page 11 of the Sale-A-Bration brochure is a list of current items that you can earn for FREE. Since it is a list, I would like to share with you a pdf file so you can see the photos of the items. CLICK HERE for this file. Remember if you choose any of these items as your FREE product, you need to enter the item number in the Sale-A-Bration brochure NOT the item given in the main catalog. If you use the main catalog number, you will list the product as a purchase item. The item number in the Sale-A-Bration brochure (Pg 11) will list it as a earned FREE item. For each $50 you spend (before tax & shipping/handling), you will receive a FREE product during Sale-A-Bration. There is just so much GREAT news to share today. This will be my 3rd post, but I just didn't want to wait to share all the news with you. If you would like to see the other posts (and are reading this on the internet NOT via e-mail notification), click on KREATESKARDS in the header of the blog, that will take you to the home page where you can scroll down to read all the posts. Here are the designs that are in the Sale-A-Bration CD. You can earn it FREE just by placing a $50 order (before tax & shipping/handling). I'm definitely going to get this one. Love all the choices it has it in and I know I will be using it a great deal. So Much Digital Content, So Much to Sale-A-Brate! January 25, 2011 Here at the home office we've been preparing for over six months to have everything ready for our annual Sale-A-Bration event. We're so excited that the time is finally here! Every year, customers and hostesses have the opportunity to earn exclusive Sale-A-Bration products with a qualifying purchase or a qualifying workshop. This year (for the first time ever!) we are offering a Sale-A-Bration Digital Content CD (item 123681). Packed with dozens of stamp images, new Designer Series Paper designs, Quick Accents, and even buttons and ribbons, this CD has everything you need to create and print beautiful cards, scrapbook pages, journals, calendars, and more. This digital content is only available as a part of the 2011 Sale-a-Bration promotion. Punch Bunch Stamp Brush Set Five-piece stamp brush set. Notes Stamp Brush Set Three-piece stamp brush set. Bliss Stamp Brush Set Five-piece stamp brush set. So Happy For You Stamp Brush Set Ten-piece stamp brush set. Sweet Summer Stamp Brush Set Nine-piece stamp brush set. Ice Cream Parlor Ribbon & Button Kit Three digital ribbons, three digital buttons. Ice Cream Parlor Designer Series Paper & Accents Kit Six Designer Series Paper Patterns, nine borders, 20 elements, and 27 flowers. Stampin' Up! just announced the release of new Digital Downloads, so I wanted to let you see them right away. This is my 2nd post today. The first post tells you all about Sale-A-Bration which is a HUGE promotion by Stampin' Up! you won't want to miss. Click on the KREATESKARDS in the header of the blog, then scroll down to see all the posts. 124010 Notes and Details Stamp Brush Set $3.95 Eight-piece stamp brush set. Download includes a one-page 11" x 8-1/2" designer template. 124011 Thoughtful Overlays Stamp Brush Set $3.95 Thirty-four-piece stamp brush set. Download includes a one-page 11" x 8-1/2" designer template. Artwork is exclusive to My Digital Studio! 124023 Sweet Stitches Fabric Brads $1.95 Six digital designer fabric brads. Coordinates with the Oh Sew Suite line. 124021 Pompom Trim $0.95 Download includes three pompom trims in Daffodil Delight, Melon Mambo, and Tangerine Tango. Coordinates with the Oh Sew Suite product line. 124487 Chocolate Bunny Stamp Brush $1.95 One oversized chocolate bunny image. 124489 Island Oasis II Designer Series Paper $4.95 Twelve Designer Series Paper patterns. Coordinating colors are Rich Razzleberry, Pacific Point, Melon Mambo, and Daffodil Delight. This download is a recolor of our popular Island Oasis Designer Series Paper. 124494 Tropical Party Stamp Brush Set $3.95 Five-piece stamp brush set. Coordinates with Island Oasis II Designer Series Paper. 124493 Sweet Scoops Stamp Brush Set $3.95 Eight-piece stamp brush set. 124540 Chat Room Birthday Stamp Brush Set $5.95 Ten-piece stamp brush set. Uses a section of sentiments from the retired Chat Room Rub-Ons. 124495 Watercolor Trio Stamp Brush Set $3.95 Seven-piece stamp brush set. Includes imagery from the now-retired Watercolor Trio Stamp Set that was featured in the 2010 Summer Mini Catalog. 125160 Chat Room Thoughts of You Stamp Brush Set $5.95 Ten-piece stamp brush set. Uses a section of sentiments from the retired Chat Room Rub-Ons. Stampin' Up! Sale-A-Bration starts today - Learn how to earn FREE product !!! Stampin' Up! 's Sale-A-Bration starts today and runs thru March 31st, 2011. What a great way to earn FREE products from Stampin' Up! With every $50 you spend (before tax & shipping/handling) during this promotion, you will earn one FREE product of your choice from the Sale-A-Bration brochure. There is NO limit on the number of FREE products you can earn or how often you order. In my opinion this is our biggest promotion of the year. Customers and demonstrator alike wait for this promotion to start. If you host a workshop of at least $300 (before tax & shipping/handling), you will one FREE Sale-A-Bration product in addition to the generous hostess benefits. Have you thought about becoming a Stampin' Up! Demonstrator, this would be a great time to sign up. By joining Stampin' Up! during Sale-A-Bration you will receive 15% off your starter kit. That means paying $148.75 plus tax and FREE Shipping instead of $175 plus tax and FREE Shipping. PLUS with your starter kit you will receive a bonus bundle filled with over $50 in FREE products. Feel free to contact me if you would like to place an order, have a workshop, or join my team as a Stampin' Up! Demonstrator. My e-mail link is at the top of this page. Also if you would like to order right away you may order on-line via my Stampin' Up! Website. If you would like to read more about becoming a Stampin' Up! Demonstrator, there is more information HERE and you can join right away by clicking on JOIN NOW from my site. I have had requests recently for a masculine card, and I felt this one was a perfect choice. I had card stock left over from my classes on Saturday where I taught how to make the Tri-Fold Gate Card. I followed the same idea as on the tutorial, however with this card I adhered the ribbon to the inside panel of the card instead of the outside panels PLUS I added in some brads to accent the center outside piece. I like how the extreme sets are silhouettes and will be perfect in any color. Sale-A-Bration starts tomorrow. 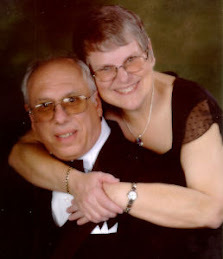 I've added the link to the Sale-A-Bration brochure on the right side of my blog if you would like to view it on-line. Biggest Stampin' Up! promotion of the year in my opinion. Great opportunity to earn FREE product with every $50 order (before tax & shipping/handling). Classes on Saturday were great fun. I always enjoy teaching, and being with others who share my passion for paper crafting. I gave out the chocolate cards that you saw yesterday, and they were a big hit. Just a quick reminder today that the Filled With Love Bundle ends on the 24th (Monday) and Sale-A-Bration starts on Tuesday. Thank you for following my blog. Tomorrow I will have more ideas for you. Taking a bit of a break today, hope you understand. Have you ever seen a stamp set and just knew you had to have it??? This was one of those sets for me. Chocolate is a favorite of so many people and the humor in this set is wonderful and perfect for this set. The card that I made could be for a Thinking of You, Just Because or as a small gift to someone. Wait till you see what is inside. The photo above is of the envelope. I stamped the chocolate bar sentiment with Early Espresso. I layered 2 pieces of DSP from the Filled With Love Bundle .. (this is only available a few more days, then will no longer be available). When you open this card, inside is a square of chocolate. I adhered it with Dotto so it can be easily removed. Bundle Promotion Ends January 24th. Sale-a-Bration starts on January 25th. I will have a link to the Sale-A-Bration brochure on-line here on my blog as of the 25th. 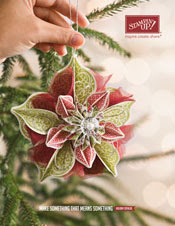 In the meantime, if you do not have a demonstrator and would like copies of the current catalogs please e-mail me. 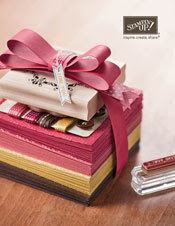 During Sale-a-Bration (Jan 25th thru March 31, 2011) if you spend $50 (before tax & shipping) on Stampin' Up! produts, you will earn one FREE Sale-A-Bration product of your choice (all are listed in the brochure). Host a workshop of at least $300 (before tax & shipping) and earn one FREE Sale-A-Bration product in addition to the generous hostess benefits. Join my Stampin' Up! Team by becoming a demonstrator during Sale-a-Bration and get 15% off your Starter Kit. PLUS, get a bonus bundle filled with over $50 in FREE products. If you are interested, contact me for additional information. I have demonstrators all over the US as part of my team. Part of my team are hobby demonstrators (those that are in it for the discount only) and the rest of my team are business builders who are working to build their own teams too along with their customer base. Stampin' Up! allows both types of demonstrators, so you choose what is best for you. Sewing designs, stamps, digital designs, embellishments and "sew" much more is a big part of the design industry this year and Stampin' Up! has many of these products to offer. Our Occasion Mini Catalog is load with DSP, stamp sets, fabric, buttons, rub-ons, fabric designer brads, post album (scrapbook, photos), embosslits for the Big Shot, and digital images/designs for My Digital Studio. My card above is a Thank You Card that I made using Pacific Point Card Stock and Classic Ink along with Whisper White Card Stock. I really like the Jumbo Wheel that has all the stitch patterns on it. The Button, Button stamps set has 17 different buttons to choose from. Many match up with paper punches that Stampin' Up! carries making them very easy to stamp and punch out. Sale-a-Bration starts on January 25th. For every $50 in Stampin' Up! product purchased (before tax and shipping), you will earn 1 FREE Stampin' Up! product from the Sale-a-Bration brochure. If you are already on my mailing list, you should of receive your brochure already. If you did not receive it and/or the Occasions Mini Catalog, please e-mail me so that I can send you another one. If you do not already have a demonstrator, live in the US, and would like to have a copy of the Occasions Mini and Sale-a-Bration catalogs, please e-mail (link above) with your name and mailing address. I will send them out to you right away. Stampin' Up! has Rub-Ons!!! The ones featured here are called Love Impressions and are item #121886. Two sheets of different designs are priced at $7.95. These are on Pg 8 of the Occasions Mini Catalog. Additional designs/styles can be found in the Idea Book & Catalog (2010-2011) on Pg 184. I tried these today for an anniversary card (Happy Anniversary Danny & Lisa). When using the rub-ons I found that it was easier if I cut out the section of the design I wanted. Then put the design where I wanted it on the card. The pack comes with a stick, but I used the Stampin' Up! Bone Folder. It gave me a wider area to apply pressure to the rub-ons. Worked well. These would work well for an anniversary, Valentine, or card to express LOVE. Rub-ons are perfect for any age papercrafter too. Easy to use, and can be used on any non-porous surface. The other day on my blog I showcased a Simply Adorned Purse Charm/Key Ring that I made. I wanted to pass on to you additional information about this product. I'm so excited about the Purse Charms and know I will be making a few more. Love it as a gift idea too. Our Simply Adorned line beautifully combines the best of two worlds: stamping and jewelry! We designed our Simply Adorned charms to hold a creation you design yourself, making your jewelry truly unique. Simply Adorned charms are lockets--they open up so you can insert your custom stamped image. The Charming stamp set, along with Rub-Ons, glitter, ribbons, and other embellishments, can help you create your unique charm insert. And don't forget that you can embellish the chains with ribbon, felt flowers . . . the possibilities are endless! The frame surrounds tempered beveled glass on the front and flat glass on the back. Because there's glass on both sides of the charm, you can display an image on one side or both. You can create a custom heirloom piece that you'll never want to change, or you can swap artwork in and out, depending on your mood and your wardrobe. And although we designed Simply Adorned charms to be jewelry, they also make delightful key chains or Christmas tree ornaments. Insert a stamped image or photo of your loved ones, tie a ribbon through the clasp, and you're done! Paper-crafters and noncrafters alike--will love the look of Simply Adorned and appreciate how easy it is to create custom jewelry. When you wear your own Simply Adorned necklace with artwork you created yourself, be prepared for questions about where you got it! Our Simply Adorned line includes nickel-plated charms in a variety of sizes, anodized stainless steel chains in two lengths, a bracelet, and a new line of baubles! Q: What size are the charms? The size listed refers to the charm insert; the metal frame around the insert is slightly larger. You can use the included insert as a template to create the perfect-sized piece of artwork for your frame. It is important that your insert matches the insert template exactly. The hinge on your charm can break if your insert is too large and overlaps onto the frame. Q: Is the toggle clasp meant to be worn in the front or the back? A: Our stainless steel chain features a toggle clasp and includes an exclusive Stampin' Up! charm identifier. The beautiful leaf charm is designed to be worn on the front to enhance the overall design of the necklace, or worn on the back for a simpler look. Q: What materials are used to make Simply Adorned jewelry? A: The charms are nickel-plated zinc alloy with tempered beveled glass on the front, and tempered flat glass in the back. The chains are anodized stainless steel with a nickel-plated zinc alloy charm and toggle. Q: How do I clean my charm? A: Use clean water and a cotton applicator to clean the jewelry surface. Do not use alcohol or other chemicals to clean your jewelry as they will damage the finish. Q: How many layers can I fit inside the charm? A: The number of layers that fit inside each charm depends on the type of materials used. The space in the charm is 2 mm; as card stock, Designer Series paper, ribbon, and adhesives all differ in thickness, it is difficult to specify the number of layers that will fit inside. It is important to remember that you can break the hinge on your charm if your inserts are too thick. Never force the charm closed. If the charm does not close easily, remove a layer or two from your insert and try again. Q: How is the jewelry packaged? A: Each piece comes in a Chocolate Chip box (box for charms: 3-1/4" x 2-1/2" x 1"; box for chains: 9-1/2" x 2-1/2" x 1"). Q: What are Simply Adorned Baubles?A: Our Simply Adorned Baubles add a bit of bling to any bracelet, charm, or chain-or to cards and other projects, as well! Baubles feature a lobster clasp and come in Black Crystal, Clear Crystal, Pink Crystal, and Vanilla Pearl. Crystals are approximately 5/8" and the pearl is approximately 1/2". Wait till you see the newest downloads for My Digital Studio ... WOW !! 124022 Sweet Stitches Designer Buttons $2.95 Three button styles in Tangerine Tango, Melon Mambo, Chocolate Chip, and Daffodil Delight. Total of 12 buttons. 124028 Pattern Pieces Stamp Brush $1.95 One oversized fabric pattern. Coordinates with the "Oh Sew Suite" product line. 124018 Blossom Petals Punch $0.95 Four-piece stamp brush set and one 5" x 7" greeting card designer template. 124019 Build a Blossom Stamp Brush Set $5.95 Twelve-piece stamp brush set. Coordinates with the digital Blossom Petals Punch. 124027 Eat Chocolate Stamp Brush Set $3.95 Four-piece stamp brush set. 125161 Top 10 Photo Book Template $14.95 This 24-page designer template (11" x 8-1/2") was used to make the My Digital Studio Professional Print Product Sampler, demonstrator supply item #124261. 125162 2011 Pennant Desktop Calendar $14.95 This 25-page calendar template (5-1/2" x 6-1/2" calendar with easel) was used to make the My Digital Studio Professional Print Product Sampler, demonstrator supply item #124261. 125623 Baja Breeze Flower Bouquet Birth Announcement $1.95 Double-sided baby boy announcement postcard designer template. Colors are Baja Breeze, Kiwi Kiss, and Basic Gray. 125163 Regal Rose Flower Bouquet Birth Announcement $1.95 Double-sided baby girl announcement postcard designer template. Colors are Regal Rose, Kiwi Kiss, and So Saffron. This template was used to make the My Digital Studio Professional Print Product Sampler, demonstrator supply item #124261. 125164 Play Date Invitation Designer Template $1.95 Birthday greeting card invitation template. Front and inside of card are pre-designed. Template includes nine embellishment pieces and was used to make the My Digital Studio Professional Print Product Sampler, demonstrator supply item #124261. 125165 Snowflake Flurry Holiday Trifold Card Designer Template $1.95 This 4" x 9-1/4" trifold card designer template was used to make the My Digital Studio Professional Print Product Sampler, demonstrator supply item #124261. 124542 Chat Room Rock Star Stamp Brush Set $5.95 Ten-piece stamp brush set. 124543 Chat Room Friend Stamp Brush Set $5.95 Ten-piece stamp brush set. 124486 Chat Room Baby Stamp Brush Set $5.95 Ten-piece stamp brush set. Box Kite Card - Which do you like? Happy 24th Anniversary Hal ... I love you! Occasions Mini Catalog is now live !!!! AND the WiNNER IS plus a sneak peek!! !